Fantastic project for a modern villa, located in a quiet and residential area of Lagos, only a short walk to all amenities and only a few minutes’ drive from the beaches. 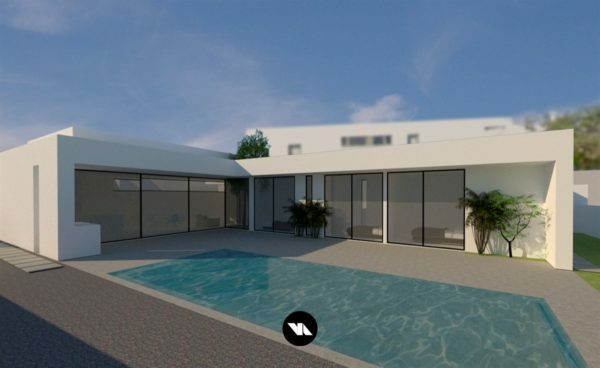 This single storey modern villa will set on a plot with 664m2, and will comprise a large living and dining area with a fully fitted open plan kitchen, equipped with integrated appliances, 3 double bedrooms with built in wardrobes and en-suite bathrooms, a laundry room and a guest toilet. Further features include: electric shutters, air conditioning (heating and cooling), solar panels for the hot water, pre-installation for underground heating system and a garage. Outside there will be a sunny terrace located close to the swimming pool, and a garden with a full irrigation system. This is a great opportunity to acquire a modern styled villa that you can personalize at your own specific taste.